Maia in costume before her very first dress rehearsal. 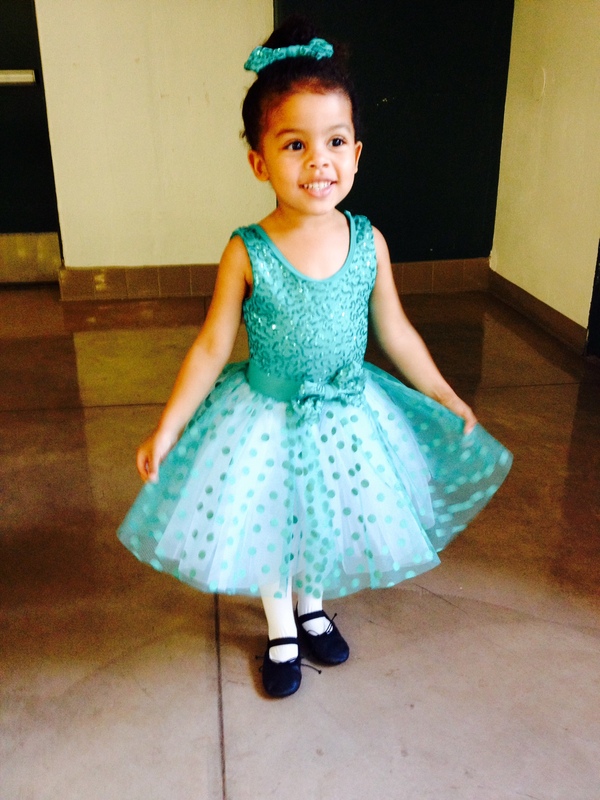 [Matt] This coming Sunday, May 31 Maia will perform in her first-ever dance recital. She has been taking a dance and exercise class called Petite Feet every Friday at her preschool this year, and she loves it. It is never difficult to get Maia to school on Fridays, just mention “it’s Petite Feet day” and she’s ready to run out the door. This recital is as big a deal as can be for an event featuring two- to five-year-olds. There will be a couple dozen groups from a different preschools, a total of 200 or so little kids! (So it could be a complete train wreck.) They are selling tickets and everything. We had to buy Maia a specific, not-cheap costume. There was a dress rehearsal last Tuesday, and since it was at 5 PM and a 20-min drive in the wrong direction from Kerean’s 40-min drive home from work, I got to take her. I have to say her costume is cute. (See the photo? Guess who did her hair? THIS guy!) After seeing some of the, shall we say, more Hallowe’en-like costumes worn by most of the other groups, Maia will get some mileage out of hers after the performance is over and she can wear it to play dance in. And those are real, tiny black ballet shoes, her very own. Since we won’t be allowed to record the actual performance, “to avoid distracting our little performers” (and not at all to motivate us to shell out 40 bucks for the professional video recording of said performance—did I mention these were two- to five-year-olds, the majority from other schools hence WE DON’T KNOW THOSE KIDS?) I did what all the other parents were doing and recorded Maia’s group during dress rehearsal with my iPhone. The video is below, and it speaks for itself. Oh, in case you can’t tell, Maia is second from the right. And by the way, after watching half of the groups rehearse, I can say Maia’s was the largest and one of the two most entertaining groups I saw! Way to go, Puddy!! [Kerean] We are still unpacking but we are officially moved into our new home! The movers delivered our furniture today. Maia is happy. This video says it all! Every time I watch it puts a smile on my face. She likes watching it too and I just love the way her face lights up whenever she does. [Kerean] “Mommy, I want to boogie.” Then she really gets down! Bath time boogie never gets old in our house.